A funky beat, a big screen television, a bunch of puzzles, and several not at all creepy bird statues watching you from every single angle... it beats me why you'd want to Escape from Mr. Birdy Room (apart from the aforementioned peeping peepers), but Tesshi-e's latest free escape game wants you to do just that. Come to think of it... I had originally assumed this room belonged to Mr. Birdy, but... he never struck me as an egomaniac. Which means... this place belongs to someone with one serious Mr. Birdy fetish! I'm not saying that if you don't find your way out before they get back they'll glue feathers and a bow tie to you and force you to live out the rest of your life caged within this twisted shrine, but that is exactly what I'm saying. No, you have an overactive imagination! After choosing English from the main menu if that's your lingo, click around to explore and interact, gathering items and keeping your eyes peeled for the clues you'll need to eventually find your way out. This is one of those escape games that sets out to be mystifying from the get-go, not just because of the all-encompassing bird motif, but because of the sheer amount of abstract clues and the lack of a changing cursor. Like all the best escape games, however, it's only confusing until you start putting the pieces together... and it includes a Happy Coin to boot. Plus, the soundtrack makes me feel like I'm wandering around inside of Earthbound, or maybe a Persona game, and that's always a plus. So start hunting for clues and cracking puzzles and find your way out! And then maybe if you haven't already, consider picking up Tesshi-e's first and currently only paid game, Escape from Mr. M's Room, and support a developer who continues to give us years of quality free escape games just like this one. Escape from Mr. Birdy Room Walkthrough now available! You start the game facing the area around the exit door. Click the canvas on the easel to take a closer look. It's a sketch of a Mr. Birdy who's accessorized with a stylish pair of sunglasses. Maybe it's just a fashion tip or maybe this is a clue... Let's remember it for later, just in case. Back up and turn left towards the couch. Let's examine the red stool beside the couch more closely. Click the stack of books to look in the middle of them, revealing a REMOTE CONTROL. Take a quick look at the REMOTE CONTROL in your inventory. Click the panel at the bottom of the remote to see it's missing some batteries. Lower the books and away from the stool, then click the sofa to zoom in on the seats. If you lift the left pillow, you'll see a series of symbols on the left couch cushion that look like the blank numbers you'd see on a digital clock. Notice how most sections are white, but each digit also has pieces of red. Click and hold the left couch cushion to remove it, where you'll find even more white and red digits under the seat. Lift the right pillow and then check under the right couch cushion to discover the remaining two series of symbols. On their own the symbols on the couch don't make much sense, but if you put them all together, you'll discover an interesting clue. The red sections of each digit combine to form a single number. The white sections are blank spaces, so you can ignore them. Let's start with the digit on the left. Add together every red piece in the first digit on all of the cushions and you'll find that they combine into the shape of the number 3. Do the same for the next three digits to find the complete combination. From left to right the numbers are: 3 8 6 7. Now that we have all four numbers, let's find a place to use them. Turn left twice to face the television and then inspect the stair-shaped stack of drawers. Click the bottom right drawer for a close-up view. How convenient! This drawer has a 4-digit combination lock and you just happen to know four very important numbers. Enter the four numbers you found on the couch - 3 8 6 7 - to unlock the drawer, which then opens automatically. Take the pair of BATTERIES from the opened drawer. Inspect the REMOTE CONTROL in your inventory again. Open the panel at the bottom of the remote, then select the BATTERIES and put them inside the empty space. Ta-dah! Now you've got a powered remote. Close the item window when you're done combining the two items. Return to the view of the stair-shaped drawers. Click the bottom left drawer to open it and take the can of LUBRICATING OIL inside. Next, open the top left drawer to look inside and find a NOTE. Examine the NOTE in your inventory. There are three letters here which appear to have been split in half. We'll have to keep an eye out for where the other half of the paper might be. First push the power button at the upper left side of the remote to turn on the TV. Press the buttons on the numpad to cycle through the first six channels. Pay close attention to the images that appear on each channel. Channels 1 to 6 all have a picture of Mr. Birdy, which appears as one of four possible colors. The Mr. Birdy on Channel 1 is red, Channel 2 is white, Channel 3 is blue, Channel 4 is white again, Channel 5 is blue again, and Channel 6 is green. There's another place in the apartment where the red, white, blue, and green Mr. Birdys all appear together. Let's take a look there now. Back up and then turn right twice to return to the view of the couch. Click the cork board on top of the glass cabinet for a closer look. At each corner of the board is a picture of our old friend Mr. Birdy. Green Mr. Birdy is at the top left corner, Red Mr. Birdy is at the top right corner, Blue Mr. Birdy is at the bottom left corner, and White Mr. Birdy is at the bottom right corner. Step back and turn right towards the exit door. Click the framed painting of a purple Mr. Birdy on the wall to zoom in. Any escape artist worth their salt can tell you a picture frame is meant for shaking! Click the corners of the frame and you'll find the picture does just that. Remember the pictures on the cork board you saw a few moments ago? Each picture was attributed to a specific corner. Green was the upper left, Red was the upper right, Blue was the lower left, and White was the lower right. The corners of the cork board obviously correspond to the corners of the Mr. Birdy painting, but that's only half of the puzzle. You will also need to recall the clues from the television. Red Mr. Birdy was on Channel 1, White Mr. Birdy was on Channels 2 and 4, Blue Mr. Birdy was on Channels 3 and 5, and Green Mr. Birdy was on Channel 6. In order, that's: Red - White - Blue - White - Blue - Green. Upper right - Lower right - Lower left - Lower right - Lower left - Upper left. Click the corners of the painting in that order to remove it from the wall. Once the puzzle is solved, the Mr. Birdy painting will fall to the floor and two odd compartments in the wall will be uncovered. Examine the section of the wall that the Mr. Birdy painting was covering. Click the open left compartment in the wall to zoom in and take the COIN. If you click and hold the left compartment, you'll notice the cover over the right compartment slides over to the left side and then slides back as soon as you release it. Looks like we'll have to find something that can keep it in place. Back up from the left side and then click the right compartment in the wall to inspect it next. On the front of the cover over the right side you'll see three odd shapes that look like letters cut in half. Oooh, now this is familiar. 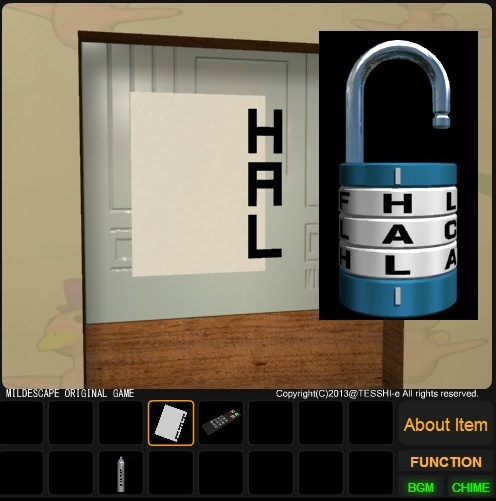 Select the NOTE from your inventory and hold it on top of the cover to combine the two halves, revealing 3 letters: H A L.
Step away from the wall and turn left to view the couch again. Click the top of the glass cabinet to take a closer look. Pick up the tin of rose tea for a close-up view. Insert the COIN into the round section at the top of the tea tin to remove the lid. Take the PADLOCK from inside the opened tin. Examine the PADLOCK in your inventory. You can click the three sections of the lock to rotate them, which changes the letters in the center. Arrange the lock sections to spell out the letters you found by combining the NOTE half with the right wall compartment: H-A-L.
Once the right combination is entered, the top of the PADLOCK will pop open. Back up and turn right towards the exit door once again. Click the left wall cache twice to zoom in. Select the opened PADLOCK, then click the left compartment one last time. The cover will move to the left side where it will be locked in place. Look inside the now uncovered right compartment in the wall to find a pair of SUNGLASSES. Move back twice and then turn right to face the television. Examine the blue Mr. Birdy statue to the right of the TV. Recall the stylish Mr. Birdy drawing we took a look at earlier and match the image in the drawing by placing the SUNGLASSES on the Mr. Birdy Statue. Take the KEY (1) from the opened panel at the middle of the pedestal. Back up and move right twice to return to the view of the glass cabinet, then click the front of the cabinet to zoom in. Use the KEY (1) to open the padlock attached to the handles. Now you can click the doors to open the cabinet. Now that the glass cabinet is open, let's have a look inside. Take the DVD from the stack of discs to the left of the hippo box. Next, pick up the DUST CLOTH beside the star box. Step back from the cabinet and turn left towards the window. Click the window to take a look through it. There appears to be a message at the lower right corner of the window, but it's covered in a layer of dirt. The dust cloth isn't able to remove the dirt, so we'll have to try again once we've found something more effective. In the middle of balcony wall are three small windows, each underneath a star that looks exactly like the star on the box in the glass cabinet. These windows have a lot in common, but there is one key difference worth noting. If you click the right window to look more closely you can count 6 iron bars. The middle window, on the other hand, only has 3 iron bars. We can't get a good look at the left window from this angle, so let's try from a different perspective. Back up from the large window, click glass door to move closer, then click the bottom of the door to look through the glass. Ahh, it's much easier to see the left star window this way. You can easily count that this window has 4 iron bars. So in order from left to right that's: 4 bars on the left, 3 bars in the middle, and 6 bars on the right. Now that we've got our numbers, let's go try them on the box! All you have to do is plug in the amount of bars in each window to its matching space on the star box (left window = left space, middle window = middle space, right window = right space). Enter 4-3-6 to open the box - easy as pie! Once the puzzle is solved, take the BOTTLE OPENER from the opened box. Turn to face the television, then click the the glass bottle on top of the stair-shaped stack of drawers to zoom in. Remove the cork at the top of the bottle with the BOTTLE OPENER to receive the CLUB KEY. Back up twice and turn right once. Click the glass door for a closer look. Select the CLUB KEY and click the door handle to unlock and open the door. Click forward to step out onto the balcony. Examine the back of the red towel hanging from the bar. It's Mr. Hippo! Below him is the world's most obvious clue: the combination 2915. Back up a few times to return inside the apartment. Turn right towards the couch, open the glass cabinet, then click the wooden hippo for a close-up view. Simply enter in the combination you saw on the towel: 2-9-1-5. Well, that was easy! Take the KEY (2) from the hippo's opened mouth. Go out to the balcony again, then examine the lockbox on the floor. Oil the rusty padlock with the LUBRICATING OIL. Now you can open the lock with the KEY (2). Lift the lid and take the SCREWDRIVER inside the opened box. Move back inside the apartment. Turn left to the stair-shaped stack of drawers. Click the middle drawer at the bottom row to zoom in. Remove the screws on the upper corners of the drawer with the SCREWDRIVER. Take out the DIAL and the CAN OF WATER from the opened drawer. Examine the CAN OF WATER in your inventory. Just like the tin of rose tea, you can open the lid of this can with the COIN. Dip the DUST CLOTH into the water to make it a WET CLOTH. Return to the balcony and then click the lower left side of the window to take a closer look. Use the WET CLOTH on the window to wipe off the stains of dirt, revealing an odd series of symbols on the window. Although the symbols look exactly the same from either side of the window, they're a little easier to see if you view them from the inside. Step back inside the apartment and click the lower right corner of the window if you want to view them more closely. Look carefully and you'll see the string of shapes is actually a series of arrows. If you use the left circle as your starting point and the right circle as the end point, the order the arrows point in is: Right - Right - Left - Right - Left - Left. Let's go back once again to the view of the stair-shaped drawers. Inspect the second highest drawer (the one directly underneath the glass bottle). Here you'll see some very familiar symbols: a left arrow, a circle, and a right arrow. Looks like we've got another simple plug-in puzzle. Press the buttons in the same order as the code you found on the window, don't forget the start and end points! Circle - Right - Right - Left - Right - Left - Left - Circle. After the puzzle is solved, you can take an odd handheld DEVICE from the opened drawer. Insert the DIAL into the socket at the center of the device to power it on. Once the device is powered, a bunch of shapes inside a grid will appear on the screen at the top of device. Additionally, you can turn the dial to the left, middle, or right setting to cycle through three different screens. At the bottom of the device you'll find the same three shapes seen on the screen: a square, a circle, and a triangle. Above these shapes are three numbers which you can click to change from 0 to 9. There are more than 9 squares and circles, so it obviously won't be as simple a matter as just counting the shapes. What we need to do here is decipher the clues on the device and find the number that corresponds to each of the three shapes. Think back to the first puzzle we solved on the couch, when we combined the red sections of the digits to make a single number. 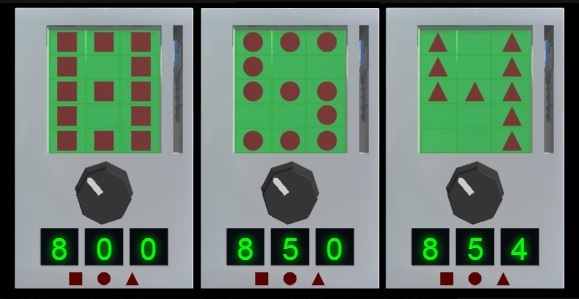 In a way, this puzzle is very similar. This time, however, you're combining each section on the 3x5 grid that is filled with a specific geometric shape to make the shape of an actual number. First, turn the dial to the left and note each space that has a square. Now turn the dial to the middle and again note the spaces where there is a square. Finally, turn the dial to the right and note the last spaces that are filled with a square. Combine all of the spaces where you found a square as if they appeared together on the same grid (it might be easier to visualize if you create your own grid to fill in the spaces yourself). Together, the squares make the shape of a single number: 8. Repeat the same process with the circle shape next. If you combine each space on the grid that has a circle shape, together they form the number 5. Do the same thing one last time with the triangle shape. Altogether, the position of each triangle on the grid combines to form the number 4. Enter the combination 8 - 5 - 4 at the bottom of the device. When the correct combination is entered, you'll be able to take the DIAMOND KEY from the slot at the right side of the DEVICE. Escape with the Happy Coin! Unlock the middle drawers with the DIAMOND KEY. 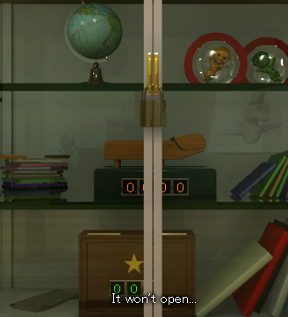 Click the unlocked drawers once to move the doors to the right, revealing a pair of PLIERS. Back up and turn right towards the window. Click the right side of the window to zoom in on a key hanging from a chain. Use the PLIERS to snip the HEART KEY off of the chain. Move back twice and turn right twice to face the exit. Now would be a great point to save, just in case!. Click the door to zoom in and use the HEART KEY to unlock the exit door. WARNING: Do not open the door yet! If you do, you will receive the "Normal Ending." If you wish to earn the "Happy Coin Ending" please follow the steps below. Carefully step away from the door and turn right towards the television. Click the TV for a closer look. Press the Eject button (the orange arrow button near the upper right side of the remote) to open the disc tray on the DVD player below the TV screen. Insert the DVD from your inventory (the one you got from the cases in the glass cabinet) into the DVD player, then press the Eject button again or the green button at the top right corner of the remote to view the DVD. The screen is split into three sections, black on the left, white in the middle, and black on the right. Inside each section are multiple Mr. Hippos. Don't worry about the way each hippo is facing, that's not important. What is important is the position of each Mr. Hippo inside each section of the screen. Imagine each hippo as a cut-out space. Now can you see the pattern? The black sections of the screen are the easiest to see, while the white middle section is a little more difficult. It's a series of numbers! There's a black 2 on the left, a white 5 and a white 2 in the middle, and a black 5 on the right. The hippos are a double clue: they indicate both the gaps in the numbers and where you need to enter this combination! Turn around to face the glass cabinet, then open the doors and inspect the wooden Mr. Hippo inside. Enter the 4-digit combination from the TV to open the hippo's mouth: 2-5-1-5. Take the HAPPY COIN from the hippo's opened mouth. Back up and turn right towards the exit. Go out the door to complete the game, Happy Coin in hand. Got the normal end, but I can't get the Happy Coin. I found the instructions on the DVD involving Mr. Hippo, but no idea how to actually do anything with them. The directions of the Mr Hippos on the screen is irrelevant. Unbelievable, I actually did one without any cheating at all! (Probably because there was no walkthrough to use...) Yay me! Will TPOP work again? We shall see. Found out what the Color Code went to. Make three 3x5 grids like the display. On the left, fill in every square with a square. In the middle, fill in every square that has a circle. On the right, fill in every square that has a triangle. Do this for each dial position. And made it out with HappyCoin! lubricating oil, silver coin and/or sunglasses? I have those, a note, and the tv remote, both of which I've used. use lubricating oil on green box outside in patio area. use silver coin on pink box of tea on top of the clear shelf and the sunglasses, put those on the blue Mr. Birdy statue beside the step-shelves thing. pliers from the middle cubby. Also, is there anywhere else I need to use the coin? the pliers can be used on the key chain (if your facing the window and click about half way down the right side of the window you will be able to zoom in on a key on a keychain.) and yes the coin can also be used on a can of water. Does anyone know how to get the Happy coin ending? 1. You start facing a wall with a Mr. Birdy picture, a door, a plant, and an easel with a Mr. Birdy (in sunglasses!) drawing. The plant and the light switch don't do anything. The picture is, indeed, wobbly. Note the sunglasses for later. Then turn right. 2. A chest on the left, with another plant on it, as well as a corked bottle with a key. The top drawer is open. Get the NOTE from it. The second drawer has three odd buttons: . We'll find a code later. The third drawer is locked. The bottom left drawer is unlocked. Get the LUBRICATING OIL from it. The bottom middle drawer is screwed shut. The bottom right drawer has a 4-digit code. Back up, then look at the entertainment center. 3. TV and DVD player. Can't do anything without a remote. I'm betting we'll need batteries as well. Back up, then check out Mr. Birdy Statue. Well. That's nice. A false panel. Wonder how we'll get it open? Back up and turn right. 4. A locked door going out, a window, a Mr. Birdy Towel outside, a smudge on the window, and some holes in the balcony wall with stars overhead that have different numbers of bars. Also, a key hanging on the right edge of the window. Can't do anything else yet. Turn right. 5. Ah! A sofa! There's going to be a key hidden under here, right? Um...what are these patterns on the cushions? Back up, then look at the pile of books on the small table. Now a pile of books. Ah! There's the remote. And no batteries. Typical. Back up then look at the cabinet. 6. Huh. On top is a corkboard with four Mr. Birdies in the corners: Green, Red, Cyan, and White. Wonder why that is? And some Rose Tea! I wish I could open it, but I can't. And locked behind the glass door is a Mr. Hippo with a 4-digit code, and a box with a star on it, and what looks like a 3-digit code. Time to start solving puzzles! 1. Go back to the sofa and combine the red segments together to get a 4-digit code. Put all the red segments in the first number in each cushion togehter, etc. Then put that code in on the chest of drawers to get the BATTERIES! 2. Put the batteries in the remote, then turn on the TV. Huh, the first 6 channels show different-colored Mr. Birdies: Red, White, Cyan, White, Cyan, and Green. Wait...I saw those colors on the corkboard. It must be the key to the wobbly painting. Open it to get the COIN. 3. What is a coin good for? Opening tea tins, of course! And I'd love some Rose Tea. I am not sure whether to be disappointed that I get a LOCK instead that has a 3-letter combination. Hey...those markings on the right plate behind the wobbly picture and the note look similar. And there's the code! Now I can secure the left plate and look in the right alcove! 4. SUNGLASSES? Why? Well, because, like the Blues Brothers, they make Mr. Birdy look AWESOME! You can see it in the drawing on the easel, and on the statue...except, wait. That Mr. Birdy has no sunglasses. Fortunately, we have a pair to give him...and we get a KEY! Sweet! Let's open that cabinet! 5. All right, Mr. Hippo! You're mine! Except...the earlier 4-digit code doesn't work. Well. There's a pile of DVDs next to you, Mr. Hippo, so I'll pick one up. Pick up the DUST CLOTH beside the Star box. And...didn't I see stars above bars through the windows? Take a look. Yup. Different numbers of bars, put them in, and...voila! A CORKSCREW! 6. Open the bottle to get a CLUB KEY. (We should write asking that translation be corrected.) And now I can get out to the balcony! 7. Before I go out to the balcony, though, let's take a look at that DVD. Huh? It just says "See you later..."? 1. Huh. A box with a lock. No key works on it. I can't get the smudge off the window using the dust cloth. On either side. Must need water. And on the back of the Mr. Birdy towel is Mr. Hippo with a 4-digit number! Huzzah! Let's enter this in to the Mr. Hippo and get another KEY! 2. Back to the balcony, and..it fits, but is rusty? Good thing I have Lubricating Oil! And there's the SCREWDRIVER. Back inside to open the bottom middle drawer to get WATER and a DIAL? 3. Get the dust cloth wet. ANd that smudge isn't coming off from the inside, so wipe it off from the outside. Oooh. That's a neat pattern. And it reads the same no matter what side of the window you're on! (That's a nice touch.) Wait...I saw symbols like that on the other drawer in the chest inside. That's it! Open it to get a DEVICE that has a spot for a dial. Well. Guess I put it in. 4. Huh...a 3x5 grid with a number of triangles, squares, and circles in it. The pattern changes with each of 3 dial settings. And below a 3-digit code with the order square, circle, triangle. Well, let's put the squares all in one 3x5 grid, the circles in another, and the triangles in a third. And there's the numbers to get the DIAMOND KEY. 5. Finally, I can open the sliding panels of the third row on the chest. Nothing on the right side, but on the left, there are PLIERS. Use those to get the HEART KEY! Now I can escape! 1. Unlock the door and head out! I'm free! 1. Unlock the door. Wait. I'm missing my HAPPY COIN! 2. Didn't that DVD say "See you later..." Let's check it out. No, now it has Mr. Hippos on a black and white background. 3. Hmm...those look like numbers! Put them in to Mr. Hippo and...there's the HAPPY COIN! 4. Now I am out, and Happy Coin is sure to bring happiness to me! Are you out? Happy to provide hints if you aren't and don't want a true spoiler. Oh, I couldn't figure out the happy coin ending, and was having the same problem other people were, even with the instructions. Um, when I insert the DVD I get a message saying "See you later" - and nothing else. Anyone else getting this? Oh I'm an idiot, have to unlock the door first. Sorry! hooray! first time I ever get out of a Teshi-e room with no hint at all - and I got the Happy Coin too! @knotofnine - me too! Can't figure out what's wrong. I put the DVD in the player very early on... dunno if that has anything to do with it? Oh, yeah! Happy coin will bring happiness and omelet rice to you! Ending not vegetarian friendly :( Look up how egg laying hens are treated in factories. Ok, I put the DVD in the player, and all it says is "See you later.." ? Creepy.